Wasps have a bad reputation. Ask ten people what they think of wasps and seven of them will tell you they do not like wasps. This is what I learned after I created a survey earlier in 2017 (simply entitled Wasps. You can still participate in the survey here). The survey was distributed via social media, email, and word of mouth. The majority of the participants considered themselves to be nature enthusiasts and gardeners, though academics and beekeepers also made up a large percentage, and lastly a small percentage considered themselves none of these things. Although the survey had some issues, and lacked some of the qualities of a professional scientific study, what was clear was that wasps as a whole are not viewed in the best light. This was reinforced in the end of the survey, when I allowed participants to write a comment relating to wasps. Some of the comments showcased knowledgeable participants who noted the beneficial aspects of wasps, including the non-stinging parasitoids (not featured in this article), and the non-aggressive nature of many of the solitary wasps. Most of the responses, however, were less pleasant with comments like I like bees but not wasps or yellowjackets are a**holes. My mission is to confront the prejudice and lay out the reality of wasps which is both fascinating and occasionally obscure (and oh so alluring to me). There is much to learn of wasps. Spider wasp, Evagetes sp. (Pompilidae) with relatively long sting. 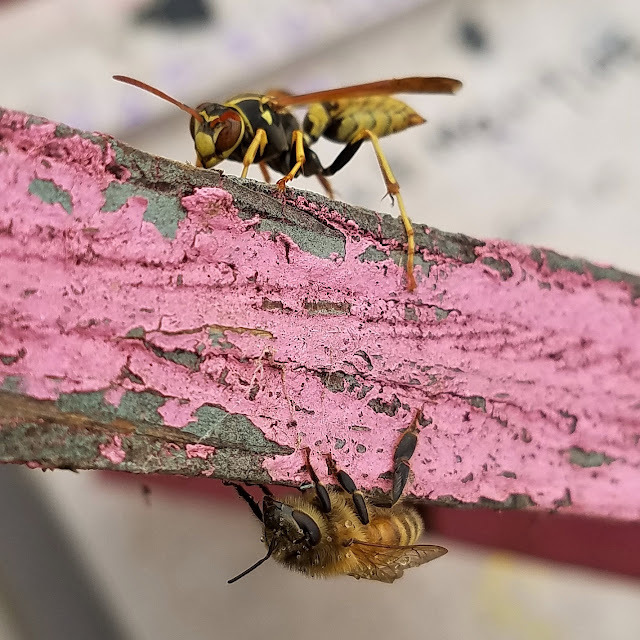 Despite the intimidating appearance of the sting, these wasps are far more likely to flee than try to sting, even when I captured one with my hand. Evagetes are kleptoparasitoids of other pompilids, and do not build their own nests. Being stung is likely the primary concern most people have regarding wasps. When it happens, it can be painful and unpleasant. Stings from bees and wasps can instigate allergic reactions ranging from itching and swelling, hives, or on rare occasions, life threatening asphyxiation. The CDC attributes around 100 deaths per year in the US to stings by insects and other arthropods (i.e. scorpions), though other sources estimate 50 deaths a year, which is one out of every six million people in the US (or one out of every three million for all stinging deaths). This doesn't discern whether the deaths were a result of allergic reaction. One common misconception is that for those who are allergic to honey bee stings they are also allergic to stings from wasps. Venom chemistry is complicated and differs significantly between wasps and bees, as well as many considerable differences between the venoms between different species of wasps, bees, and ants. No two are exactly alike, and most are dramatically different. That said, being allergic to both honey bee and paper wasp stings, for example, is extremely unlikely. For more on the science of stinging Hymenoptera and venom, I encourage the reader to see the work of entomologist and researcher Justin Schmidt. The most notorious, or rather infamous, of all wasps are the wasps in the family Vespidae. This family includes eusocial wasps such as yellowjackets (Vespula), aerial yellowjackets (Dolichovespula), true hornets (Vespa), and paper wasps (Polistes and Mischocyttarus), as well as an array of non-aggressive solitary wasps. 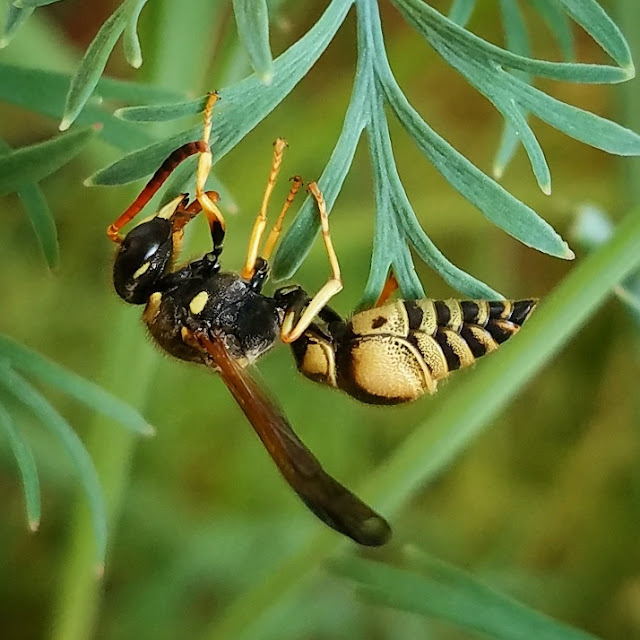 These wasps interact with people in a variety of ways, nesting under eves in the case of the paper wasps, nesting in lawns in the case of yellowjackets, or in all cases crashing your picnic or BBQ party. Social vespids are all predatory. Usual prey include flies, caterpillars, and many garden pest species, but they may also hunt larger arthropods or be attracted to carrion. Unlike the solitary vespids, chewed up pieces of the prey are brought back to the nest rather than a complete paralyzed yet living prey item. Eusocial bees and wasps inflict not only painful stings, but inflict tissue damage as well. 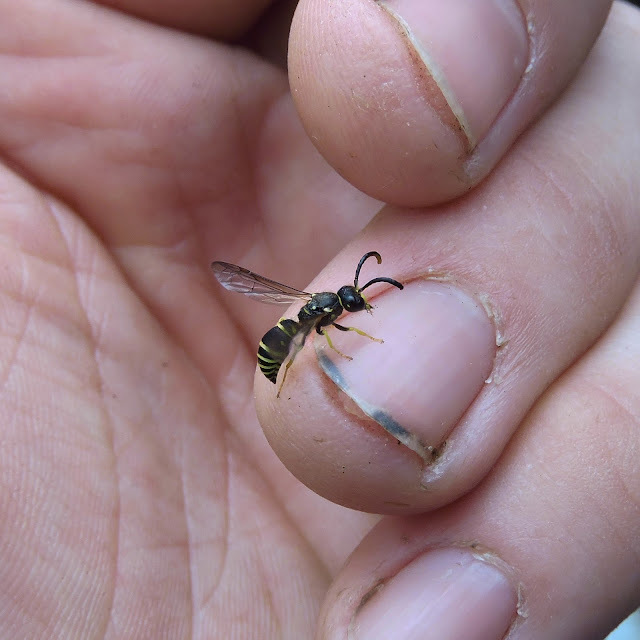 Solitary wasps and bees, by contrast, are often reluctant to sting but when they do it is often weak. 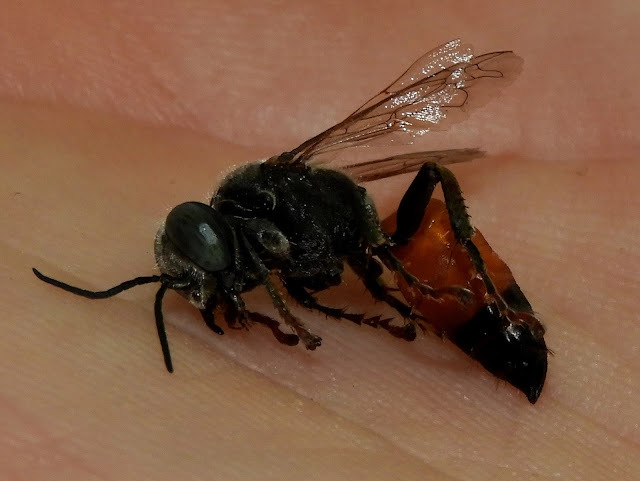 But the majority of solitary bees and wasps that are willing to sting, regardless of causing any notable pain or not, do not cause any lasting damage. The significance behind this is that eusocial wasps and bees must protect their nests which are contain their kin, not to mention any food stores they have acquired. Solitary bees and wasps, in contrast, have much less invested into their nests and can usually relocate and build a new nest. The most hated wasps, it seems, are the yellowjackets. True yellowjackets, Vespula spp., are eusocial ground nesting wasps native to every state of the US and much of Canada. They are easily disturbed and meet any perceived threat with aggression. Their habit of nesting in lawns has brought them too close to home, literally, and are often cause for concern for those with small children or dogs (as a father of two young daughters, I don't blame them! I don't usually condone the killing of wasps or bees, but if one should need to get rid of a nest then wait til the cover of darkness and pour a bucket of soapy water into the nest entrance.) Yellowjackets, like honey bees, live in nests with workers and a single laying queen (excessively large nests of yellowjackets in the southern states may have two or more queens). Queens produce pheromones, much like honey bee queens, which alter worker behavior by suppressing the instinct of workers, all female, from laying eggs. Pheromones also prevent other queens from taking over since they are just ever so slightly specific to each individual queen. Nests are composed of paper, and are structured into several layers of downward facing hexagonal cells in horizontal combs. They hunt all types of arthropods and are also attracted to carrion (or hamburgers). 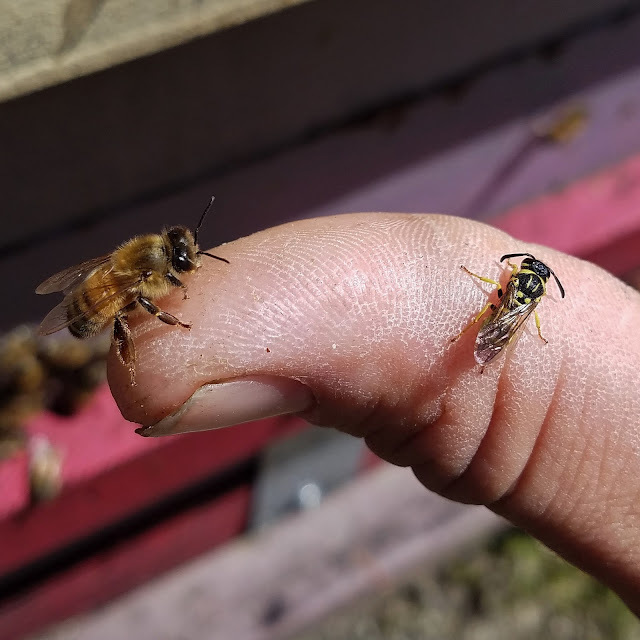 Prey is not stung, but rather bitten apart. What might appear to be stinging is actually just respiration, and the use of the abdomen as an extra limb used to grapple with prey. Paper wasps are similarly notorious and often interact with humans due to their nesting preferences. Paper wasps nest in elevated and sheltered locations, such as within tree hollows, or more familiarly, under eaves. The nests are made from paper, like all domestic social vespids, but unlike Vespa, Vespula, and Dolichovespula the comb is exposed and not enveloped in a paper shell. Nests are also relatively small, rarely growing larger than eight inches across. 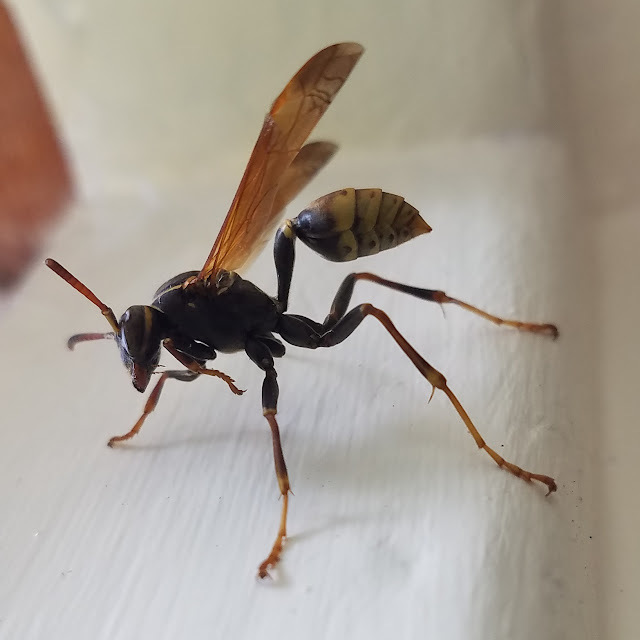 In my experience, paper wasps in Oregon are very docile and do not attack except under extreme disturbance (like the time I decided to pry a nest off with a stick). Otherwise, they seem to flee or just fly around rather than stinging. I also find the sting, when it does happen, to be mild compared to honey bees or yellowjackets. Polistes dominula is a European introduction, now widespread in the West and elsewhere in the country. 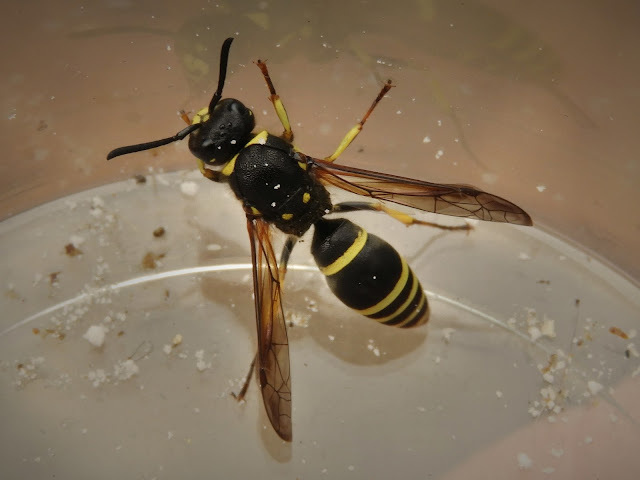 They are a highly adaptable species and less particular about nesting sites than native paper wasps. There is reason to believe they displace native species by dominating the most favorable nest sites. 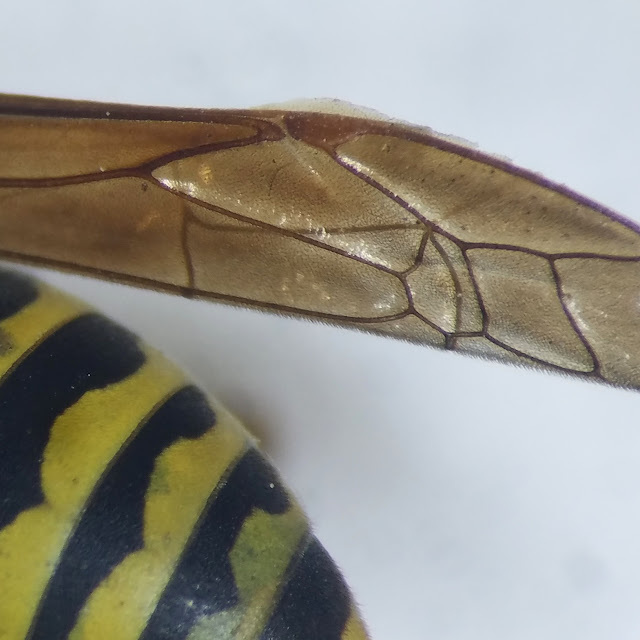 Polistes dominula, and all vespid wasps, have pleated wings. The wings appear thin precisely because the forewings are folded in half when not in flight! This is thought to prevent damaging the fragile wings while in close quarters with nest mates. This trait is also seen in a few solitary bees, flies, and a few other flying insects (all wasp mimics). 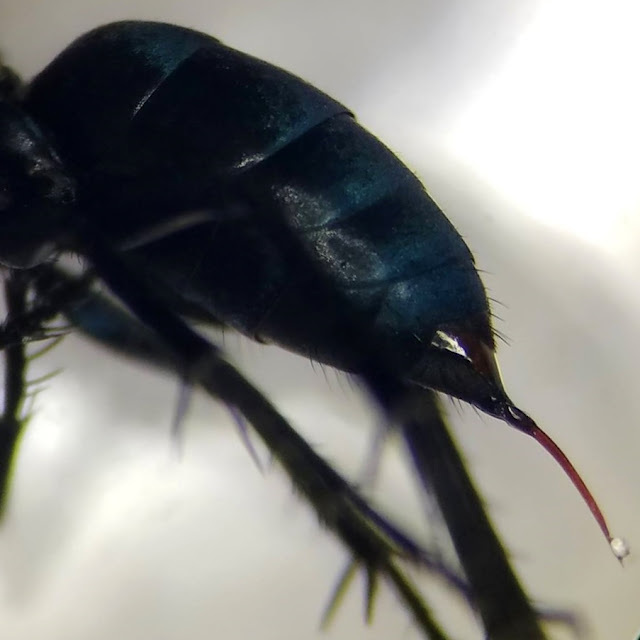 Most Hymenoptera also have fine hairs covering the wings which may serve multiple purposes including water repellency, reducing drag, thermoregulation, and perhaps other unknown functions. The length and quantity of hairs varies between different wasps and bees, perhaps catering to their varying lifestyles. 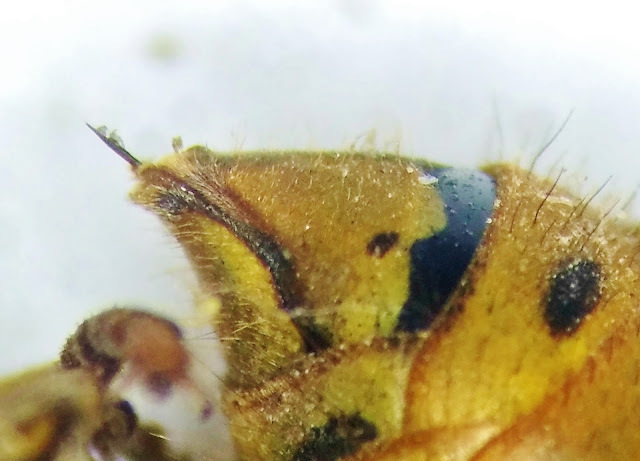 Some paper wasps use a form of facial recognition to communicate with nest mates and understand hierarchy. Species with less detailed facial patterns do not communicate this way, and instead have comparatively larger olfactory sensors. 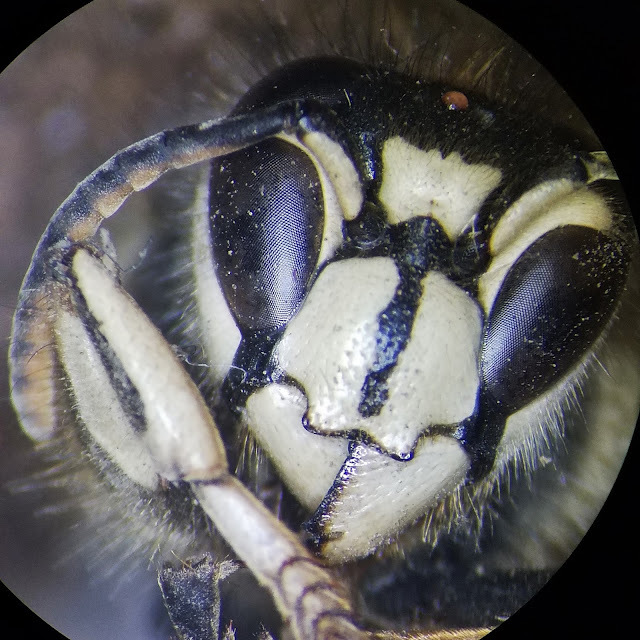 Polistes dominula, P. fuscatus, and I suspect P. aurifer, are some that have demonstrated facial recognition of nest mates. There is also some speculation that they can recognize the faces of people, though I could not find any literature substantiating that. Unlike yellowjackets and hornets, paper wasps are not aggressive towards honey bees. This is a concern for some beekeepers I have spoken to who attempt to justify their general prejudice towards wasps as a whole. In general, keeping honey bee colonies strong by the proper care and attention (i.e. IPM, feeding as needed, good genetics, etc.) will keep any wasp threat from subjugating the hive. Weak colonies are not well equipped to defend their home, thus thieves or predators may freely enter. Paper wasps, unlikely to prey on honey bees themselves, will rob honey from weak or dead colonies. I would argue that the wasps are merely a symptom, but not the cause, and actions should be taken to build up the strength of the hive rather than eliminating the perceived wasp threat. The largest paper wasps in Oregon are in the genus Mischocyttarus. They are differentiated from Polistes by having a thin elongated waist and reduced front legs, often standing on the center and rear pairs of legs. Nests are similar in appearance to those of Polistes, and my only observation is that they are less abundant than Polistes, while P. dominula is the most abundant. The long legs of all the paper wasps I have observed allow them to land directly on the surface of still water by spreading their legs and utilizing the surface tension. The narrowed but not elongated waist of Polistes wasps, as seen in the photo above, allow lay observers to differentiate them from the related Mischocyttarus. Relying on markings and patterns alone is not a reliable method of identification. For example, Polistes aurifer and Mischocyttarus flavitarsis females bear nearly identical markings and patterns in Southern Oregon, though perhaps one or both bear more distinct markings in other regions where different phenotypes take up residence. Solitary vespids are often very similar in appearance to their eusocial and semi-social (and usually more aggressive) cousins. The Vespidae contains five subfamilies, two are eusocial or semi-social (Vespinae and Polistinae, respectively) while the remaining are solitary. So far only known in California, the Euparagiinae is rare. I find the Masarinae to be particularly interesting as solitary females provision mud nests with pollen rather than insects. Maserine wasps collect pollen in their crop and regurgitate it into the nest, similar to masked bees (Hylaeus spp., Colletidae). The genus Pseudomasaris (Masarinae) is known to occur in Southwestern Oregon, though I have not seen one yet (to my knowledge). I'm keeping my eyes out, they are active in early summer and superficially resemble yellowjackets. The Eumeninae is the most common of the solitary Vespidae. In general they are smaller than their eusocial cousins, but many bear a superficial resemblance with yellow and black patterns. Others have patterns that are black with either red, white, or orange. Despite their similarity to their occasionally aggressive extended family, the solitary vespids are quite reluctant to sting and will swiftly flee if a threat is perceived. Those who have managed to somehow get a sting from one of these wasps report disappointment in such a weak defense. Their first line of defense is aposematic, the bright showy colors resemble yellowjackets or other vespids with painful stings. Eumenine wasps build nests out of mud in cavities, or as freestanding mud pots attached to something off the ground (i.e. house siding, grass, rocks). 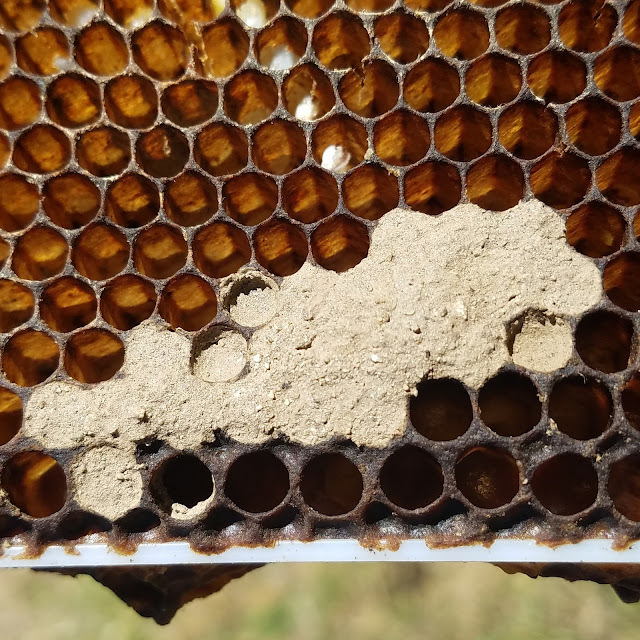 Many of the eumenines build nests in preexisting cavities such as deserted tunnels in wood or in the case of the above photo in old honey wax comb. Unlike many solitary bees which build linear nests in tunnels, mason wasps are more flexible in the nest structure. Mason wasps cap cells with mud. Potter wasps, however, build external structures that resembles pots with fared constricted entrances. In either case, the cells are stuffed with one large or many small paralyzed caterpillars and an egg, then left to their own devices. In 2016 I collected some mason wasp nests built in old honey bee comb to rear them and attempt to identify what emerged. 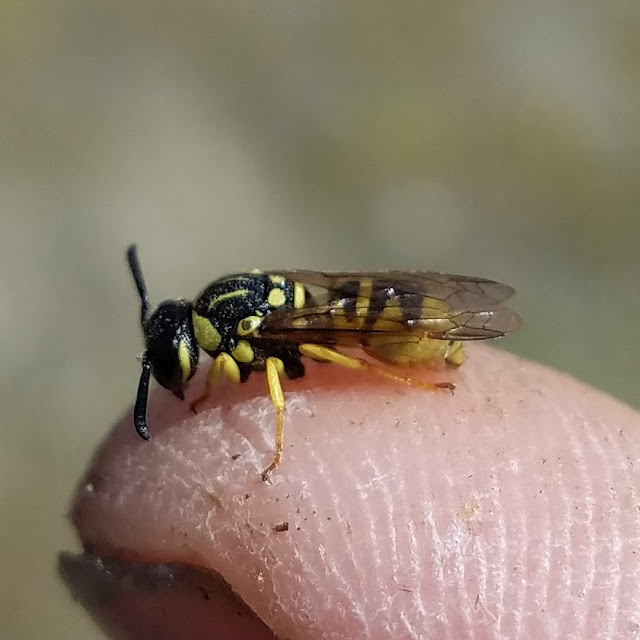 Wasps begun to emerge as early as February (2017), starting with male Ancistrocerus as seen on my finger in the above image. Eumenine wasp eggs hatch shortly after they are deposited, within days to weeks, and quickly devour their paralyzed caterpillars. They enter winter as prepupae and remain that way until pupating the following year. I suspect temperature plays a large role in their pupation and emergence. At the time of the emergence of those first few Ancistrocerus males, there was still some remnant snow on the ground in the Rogue Valley. Secondly, the screened jar which held the nest was in my truck where it surely experience higher mean temperatures than outside, not to mention much drier conditions. Mason and potter wasps are common flower visitors. Although they don't provision nests with nectar or pollen like some of the other vespids, adults visit flowers for nectar as it is a readily available source of carbohydrates. Flowers are also occasionally the site of feeding caterpillars or other favorable larvae, so may also be where adult eumenine females might search for prey. Male eumenines do not provision nests, and do not hunt caterpillars. They do visit flowers for nectar, I captured a Ancistrocerus tuberculocephalus male foraging on deerbrush, Ceanothus cunneatus, in late spring. The best thing about the males is that they help create more females! Like all aculeate hymenopterans they can be identified by the extra abdominal segments which enable them to bend their abdomen to mate with females, and for an extra segment in their antennae, often curled at the tip. Many observers have noticed that eumenine wasps have different types of nests, within cavities or as external structures. Common names serve to delineate them by nest type, yet, there is no well known taxonomic distinction between mason and potter wasps that I am aware of. I have observed them to be morphologically distinct, however, as they can be distinguished by differences of the petiole. The mason wasps that I am acquainted with have short petioles (see photo above) while potter wasps have an elongated petiole (see photo below) much like Mischocyttarus. are in general slightly larger than the mason wasps. 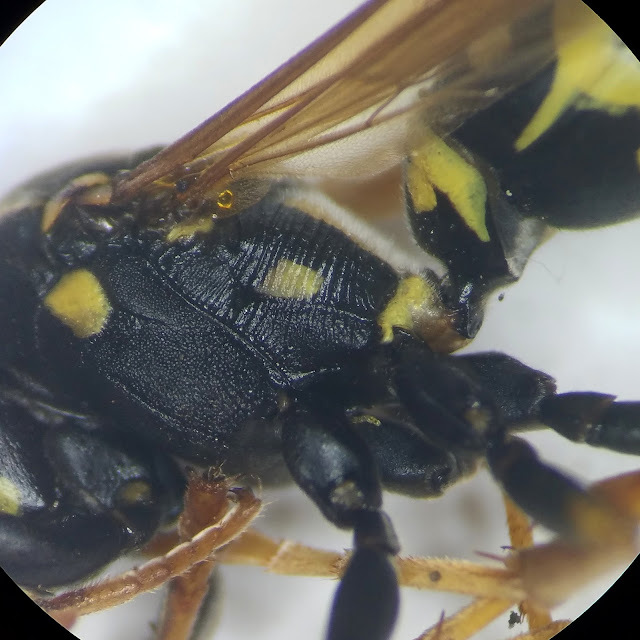 Perhaps the common names mason and potter wasp are not scientifically significant, though they do serve to describe the Southern Oregon species fairly. In my observations various eumenines are active from spring to fall, suggesting that many may be multivoltine, that is, having multiple generations throughout the year so long as good conditions prevail. The Eumeninae are mostly predatory though a few Eurasian species are phytophagous (feed on plant tissue). Adults usually feed on nectar, or occasionally on hemolymph. Prey is captured for larvae, and is completely or partially paralyzed before sealing in a cell for the wasp larvae to feed on while developing. Species can be generalists when it comes to prey, and take caterpillars or beetle larvae from many families, while others can be more picky to the point of only taking prey of a single genus of moth or leaf beetle larvae, for example. Number of prey can also be variable for some species, such as one large prey item or several smaller prey items per cell. This variability is also found to be common in the Sphecidae and Crabronidae. The Crabronidae is thought to be closely related to the bees, the latter having evolved from the former. Ironically, some crabronids prey primarily on bees and other hymenopterans. Many crabronids are even mistaken for bees as they share some superficial traits. Having been fooled myself, I am certain of this. The Crabronidae prey on a wide variety of other insects and spiders. Prey are usually paralyzed and brought back to the nest for larvae to feed on. Sand wasps in the genus Bembix are widespread in Oregon. They are called sand wasps because they nest directly in loose sand. I observed them on a sandy bank alongside Evans Creek (which meets the Rogue River) where a layer of hard packed silty soil formed a layer a few inches below the sand. The nest entrance itself fills with sand when the wasp isn't actively entering or exiting, so often appears as a small divot in the sand. Sand wasps are great diggers, diving into the sand with great ease, casting particles of sand behind them as one might imagine a digging dog. Bembix prey on flies, and don't seem to be specific about which types. Flies are paralyzed with venom and brought into the nest. Bembix provision cells progressively as their larvae develop, delivering up to twenty flies for each larva. Bristly hairs on their legs allow females to dig through sand with the two front legs while carrying prey with the remaining legs. Steniolia dig nests in soil rather than sand, but are otherwise very similar to the sand wasps. I have also observed them to be slightly larger than Bembix, at least the species I've encountered. Nests descend six to seven inches ending in a single cell which, like Bembix, is provisioned progressively with flies as the larvae develops. Both genders of the genus cluster at night to share warmth, which is also when mating occurs (I haven't observed this, but I'd love to some day). Steniolia male visiting Monardella sp. Steniolia have very long tongues (probosces) when compared to other wasps, longer than many bees too. They have a particular interest in violet colored flowers such as thistles, some monardellas, and purple coneflower. Alternatively they are also known to be drawn to orange, yellow, or occasionally (but far less frequently) white flowers. Males can't sting, but are equipped with a double pronged pseudosting at the tip of the abdomen. Crabronids in general are quick and will readily flee if danger is perceived, but I hypothesize that if I were to capture a male with my hand he would poke me quite hard, perhaps hard enough to make me release him as a reaction. I have experienced a similar reactionary response when handling male wasps of all kinds who simply motion as if to sting, sans the pseudosting. Fear of being stung is powerfully integrated into the human psyche. Beewolves, Philanthus spp., are one of my favorite genera of all wasps. As much as I love bees, this bee-predator has charmed me. Beewolves are a group of ground nesting wasps which, unlike Bembix and Steniolia, mass provision cells before laying an egg and sealing the cell. Their primary prey are small bees, mostly but not strictly halictid bees (possibly a result of the abundance of halictid bees, some of which are semi-social), however beewolves are known to prey on other wasps and even occasionally other types of insects as well. Up to two dozen prey items will be packed into each cell before an egg is laid. I found Philanthus gibbosus nesting in near vertical banks along Evans Creek near the Rogue River. Sand wasps (Bembix americana) and osmiine bees were also nesting in close proximity. Some species of Philanthus are known to share a nest entrance but continue to provision their own nests within. Philanthus females are also known to line their cells with microbes which protect the developing larvae from potential pathogens. I wonder if this behavior occurs in other types of wasps or bees, yet awaits discovery. Ectemnius wasps prey on flies, mostly hover flies (Syrphidae). Unlike the aforementioned crabronids, Ectemnius nest in dried twigs or stems with soft pithy centers, or in holes in dead or decaying (soft) wood, varying between species. Cells are made from chewed pith and stuffed with flies, or maybe few to single large flies, depending on the species. In August of 2017 I hiked to the alpine zone of Mt McLoughlin halfway between Klamath Falls and Medford. I was fortunate to photograph Ectemnius nectaring on an unknown carrot relative (Apiaceae). Many other hymenopterans were active, from small halictid bees to sphecid wasps, pompilids, and chrysidids. Numerous dipterans (flies) were also active. Alpine and subalpine environments exhibit more extremes than lower elevations (i.e. climate), and life up there has evolved to survive the unique challenges presented. Plant life in the alpine and subalpine zones is particularly interesting, though notably more sparsely dispersed than the lowlands. This may lead one to think that life is less diverse in the mountain ecosystem, but that is a fallacy. Pollinators are quite numerous in the alpine zone, though not the same mix of pollinators found in the lowlands. Flies are very important pollinators of alpine and tundra environments since they are better able to cope with poor weather conditions, though many types of bees and wasps also flourish when the weather is favorable. I had originally mistaken this square-headed wasp for a honey bee, because honey bees were foraging on the milkweed in great numbers and the wasp was of a similar size and shape. Tachytes nest in the ground and provision each cell with Orthoptera adults or nymphs, primarily grasshoppers or katydids. Prey selection is somewhat specific depending on the Tachytes species. Some will provision every cell with a prey item before laying any eggs, temporarily storing the orthopterans in a special chamber off to the side while chambers are being excavated. Like many crabronids, this Tachytes was difficult to observe. 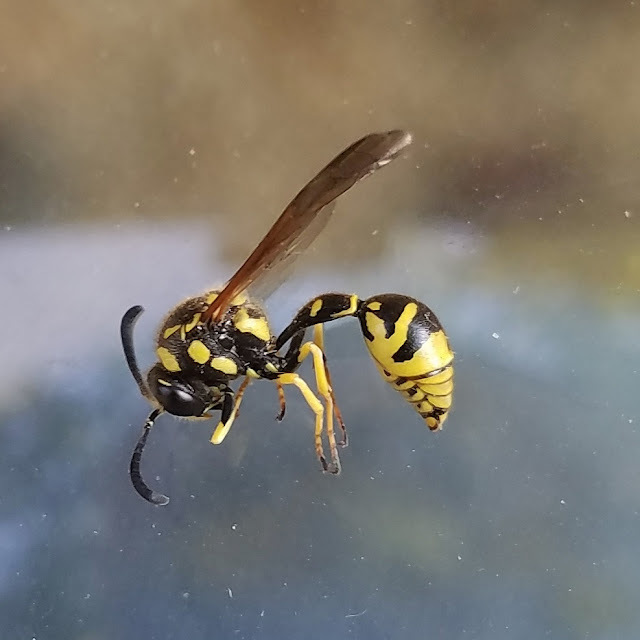 To get a better look, and have a good chance of having it identified, I captured this wasp with an insect net and placed it in a jar. I placed the wasp in the refrigerator for ten minutes. The wasp was then chilled and temporarily immobilized, allowing me to get a good look. I brought it outside into the sun so it could warm up, after which it promptly flew off. This is a good technique for viewing many hymenopterans up close, though make sure to release the specimen as close as possible to where it was captured so it may carry on. Aphid wasps (Pemphredoninae) earn their name for their choice of host. Nests are constructed within existing holes in wood and mass provisioned with aphids. Don't confuse them with the other aphid wasps, Aphidiinae (Braconidae), which parasitize the aphids by laying an egg inside them. Initially I had confused these aphid wasps for masked bees, Hylaeus spp. (Colletidae), since they both lack pollen collecting hairs and are similarly small, less than 6mm in length. They are also both common visitors to wild carrot flowers, Daucus carota, an invasive weed here in Southern Oregon. 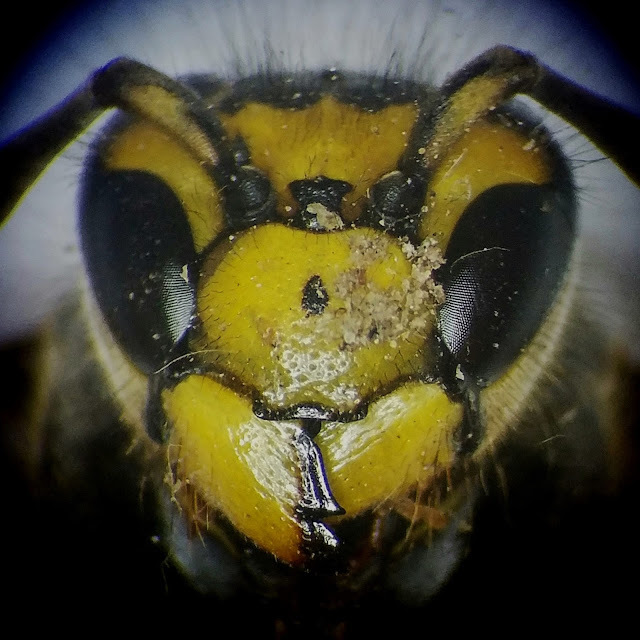 This concludes Part 1, follow the link to continue to Aculeate Wasps of Southern Oregon Part 2 which will include photos and bios of many lesser known aculeate wasps! Do you have any idea which wasp(s) build hexagonal-celled nests on the stems of poison oak?